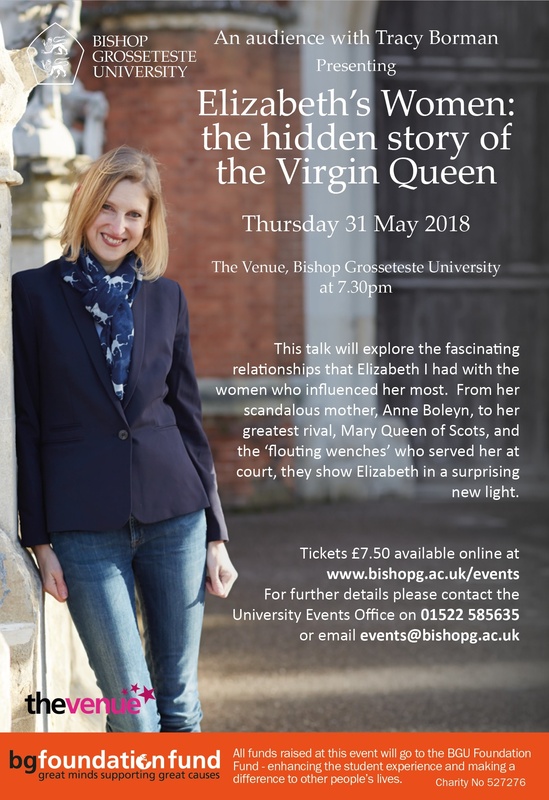 Bishop Grosseteste University (BGU) are delighted to welcome Tracy Borman, renowned historian, Chief Executive of the Heritage Education Trust and Joint Chief Curator of Historic Royal Palaces, back to Lincoln on Thursday 31 May 2018 for an evening delving deep into the riveting politics of Elizabeth I and her court. ‘Elizabeth’s Women: The hidden story of the Virgin Queen’ will explore the fascinating relationships that Elizabeth I had with the women who influenced her most. From her scandalous mother, Anne Boleyn, to her greatest rival, Mary Queen of Scots, and the ‘flouting wenches’ who served her at court, they all show Elizabeth in a surprising new light. Born and raised just outside of Lincoln, Tracey Borman is widely recognised as an expert on Tudor history with a collection of best-selling books and celebrated TV series. Her knowledge of Elizabethan England will undoubtedly ensure a compelling discussion on one of England’s most captivating monarchs. The event will start at 7.30pm and tickets for this unmissable evening are £7.50, for further details please contact the University Events Office on 01522 585635 or email events@bishopg.ac.uk.